Last month, Trevor reviewed False Prophecies, which is the debut album from death metal enigma, Undead. It's an album that we all enjoyed, here at Filth HQ, with its authentic, top-notch death metal assault. So, we are exceptionally happy that band members Necros and King Oscuro took time out of their schedules for this interview! Hi, first and foremost thank you very much for taking the time to answer these questions; it's very much appreciated by us over at The Lair of Filth. How hectic has Undead's schedule been of late, what with the album being released and subsequent press related duties? Necros: Indeed, our promotion schedule is a bit overloaded, and we like it that way. That means our album pleases the audience, we had a lot of positive feedbacks and we're really glad of it! Could you tell us a little about the band, its formation, music etc. for those reading who may not be as familiar with the band or its music? Necros: Hell is a place highly attended by phantoms, this is where we all met . We recalled our envy to restore the flame of Original Death Metal and an opportunity has been offered to us. Indeed, Time weakened the nature of the genre and we came back among the living to play the authentic Death Metal we cherish! We were fortunate enough to get listening to False Prophecies for review purposes and were very impressed with it, how satisfied are the band with the final result? Necros: We are really proud of this album because our envy could shape up. Studio work was almost instantaneous, a lot like photography. If all the circumstances are propitious to divulge the intentions, the result can only be great. As if any of these elements is weak, the issue can turn into a fatality. We had all the circumstances gathered in order to achieve in an artistic way this album: writing process, arrangements, interpretation, sound engineering , studio , visuals and so on . Everything was perfect to pay a tribute to the genre. King Oscuro: And we're proud of the whole, this album is truly symbolic to us! So far you've opted to keep membership details and identities shrouded in a degree of secrecy – why did the band decide to do so, and do you feel this decision has benefitted the band in any way? Necros: The only reason is music. We asked ourselves if it was necessary to know everything about an artist to appreciate his music, when we discover a music on radio or with the Internet, what gets to you is the feeling of unknown territory within yourself that we wanted to put forward for as long as we could with our music . A delectable feeling for the listener in my opinion. Our goal finds itself into music and nothing else. Obviously this level of secrecy will be harder to maintain with time, especially if the band decides to play live – have you any plans to do so and will the band endeavour to keep identities secret if you do decide to enter the live arena? Necros: A Phantom shows itself only when he desires. 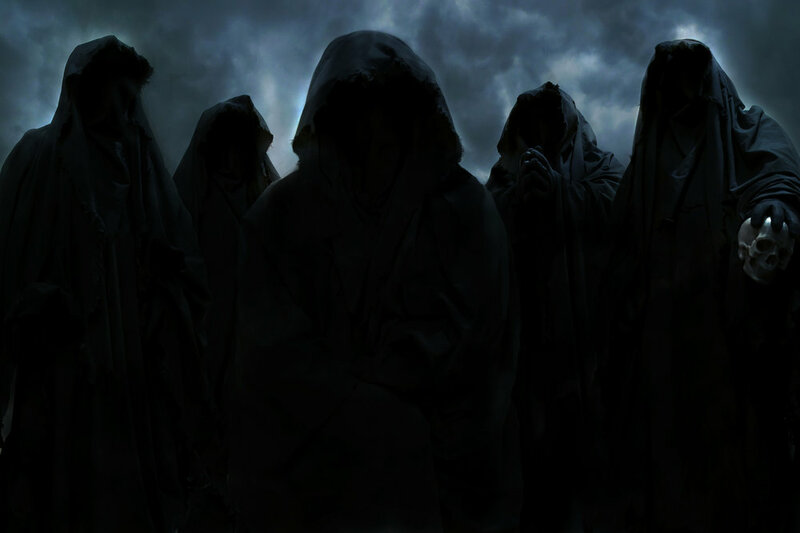 King Oscuro: When you'll see the mist coming at the distance, you'll understand. The press release received with the album stated Undead's members are "back from the dead" can you possibly allude as to whether this means you've played in bands before, and if so, which bands? Necros: We have no memory of our past lives, only our musical ability is left. King Oscuro: Our music is a new message to the world of the living, wherein only our vision matters, even if an image is but a reflection. I felt the music on False Prophecies was very cohesive and it sounds like it's the work of musicians who have played together for quite a while – have the band members been familiar with each other for a while as the music certainly suggests this is the case? Necros: Death Metal runs in our veins. We knew which path we took by recording "False Prophecies": authentic Death Metal. I suppose our compositions wer well refined and fluid in order to let each member find his place, even if we have a good control of our instruments and our own musicality. We shared a lot on the interpretation and the way each tracks would sound. Gruesome released their album "Savage Lands" which also features old school Death Metal in the vein of Death a mere ten days before your album came out – both albums are excellent and honour the music of Death and indeed old school Death Metal in general very well - are you familiar with the Gruesome album and does Undead keep up to date with releases from other bands? Necros: I give a lot of interest to bands that reopen the original codex of the genre. In the case of "Gruesome" I had difficulties to listen to the album because I find their writing process to close to "Death's". A lot of amazing bands exist on the original death metal scene, such as Deserted Fear and Demonical. King Oscuro: Gruesome is more of an evident tribute to Death , Undead is more a Death Metal celebration. I feel as long as the music is played well and doesn't rip off anyone's sound it's a good thing, and it's certainly a case of the more the better. There are, however, fans who may criticise bands that play old school influenced death metal, what would you say to these doubters about your band and its music? Necros: Music is about emotion and sensitiveness. I don't really like the stylistic compartmentalization that sectorizes the audience. I think that Death Metal, even with a little touch of a newer genre, stays Death Metal. UNDEAD takes back the base of the genre, because through time this genre was too diluted, so much that some forgot the bases, but that's my opinion. We didn't record "False Prophecies" as a fad or anything like that! We took much pleasure writing the album for we hadn't heard such songs for a long time. Apparently we weren't the only expecting such a thing, and we are proud that it pleases Death Metal Fans! To the scepticals, I think that if you like original Death Metal, "False Prophecies" was made for you, let yourself embrace the baleful procession. 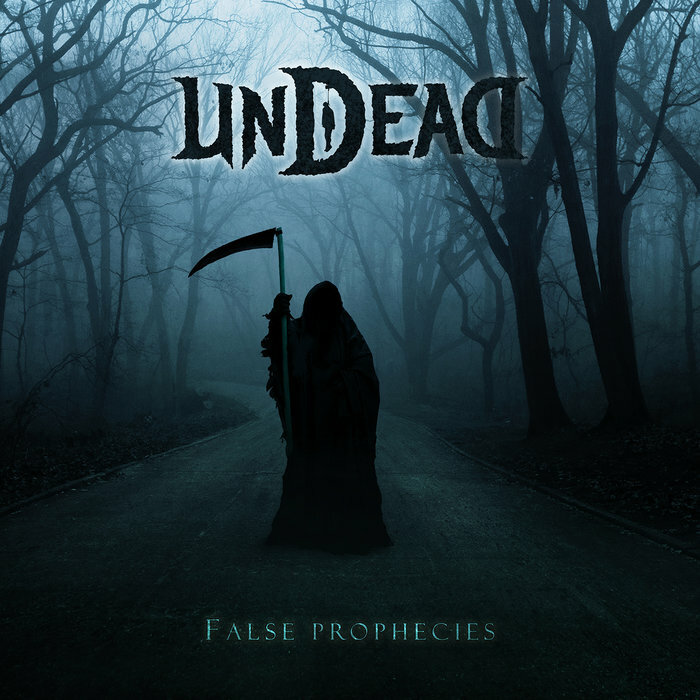 Undead's debut album seemingly came from out of nowhere, with very little hype and publicity in the lead up to the album's release – how long was the band working in secrecy, making preparations behind the scenes and can you tell us a little about the recording process, and do you have any future plans for further recordings? Necros: We took 18 months to do it. We've chosen to show our music once the mix was done. Few are the people that could hear the preprod demo. Mostly, Lars Bragten completed our vision of UNDEAD's music, only few albums as the tone of "False Prophecies" because the studio work of it was to recreate the original vibe that made first albums of Death Metal so ... magical. Lars has done a wonderful work about it, I put a lot of effort on the acoustic of the mix, with only a few effects, discrete enough to restore the authentic side we were looking for. About our future, only time will tell us. The album just went out and we're glad to present it to the audience. You're signed to an excellent label in Listenable records; do you feel the band will stay with Listenable for any future recordings? Necros: Listenable is indeed a superb label. They understood our approach and they got our back which is very important to us. Undead's old-school influences are quite apparent on listening to the album, but are there any recent bands you would cite as having influenced your sound? Necros: Original Death metal is our main inspiration, whenever it was played. Some said that the album had a contemporary touch, or sounded "Swedish". I had difficulties to understand that. We may have reborn a genre that disappeared long ago, and that's where Lars talent is most prominent, it was a humongous challenge and deal to him. If you had the opportunity to share a stage with any three bands, past or present, which would you pick, and why? Necros: In fact there are many... But I'm not programmer. Sometime, contrast gives the stage something great. King Oscuro: Any band, as long as their musical approach is authentic. Death Metal is currently enjoying a most productive period with a massive resurgence in bands and albums alike, do you feel this is a good, or bad, thing for the sub-genre? Necros: I think there was a lot of subgenre and crossover in the late years and Death Metal evoluted so much that the original genre wasn't presented anymore (or only by a few). I think it created a need from the fans, which can explain the resurgence of certain bands. Good or not, it's the audience that decides (If they want to, I mean), not me. Everyone sticks to their own place and subgenre can get along with each other. King Oscuro: I think that modern productions provided the return to a more primal genre. If Undead were given the opportunity to release False Prophecies in the present day or during the late 1980's/early 1990's which era would you choose and why? Necros: Firstly, I would say that UNDEAD is a contemporary approach of original Death Metal. When UNDEAD turned public, I apprehended a lot the appreciation of "False Prophecies". Fans give a lot of respect to the genre and personality of each band, and we do to. I wondered how the album would be perceived. That's why we presented it as an homage to original Death Metal, most likely to Chuck Schuldiner and his overall work. But as time flowed, I realized that beyond the homage, we built a singularity by gathering multiple aspect of Death Metal. Thus I allow myself to think that the album would have had its place back in the days. What do you feel the future holds for Death Metal and do you feel Undead will be a part of this future? Necros: I think that Death Metal will live long and prosper. After almost 30 years , the genre had its proper story. Time is the best test to prove the relevance of a genre. UNDEAD will be part of this future, at least I hope so. Thank you very, very much for taking the time to answers these questions, both Jude & myself (Trevor) are massive fans of your music and wish you every success both now and in the future. Necros: Thank You for the interview. False Prophecies is released by Listenable Records and is available now. You can read our review of the album here.